Sandy Jadeja, chief market strategist at SignalPro, charts the performance of the Dow Jones and says the 2014 picture is "very dark" and that a "sharp sell-off" is to be expected in the next few months. At the conclusion of the webinar, Peter Lee warned that current descent into illiquidity in the bond markets may continue without more efforts to address it. In an online poll of participants in the webinar, 85% of traders say that they do only 1% or less of their trading via electronic platforms. Below is the transcript of a recent interview with J. Kyle Bass, founder and principal of Hayman Capital Management in Dallas, and Richard Howard, managing director and global strategist with Hayman. Q: In you letter to investors in June, you talked about the rapid growth of credit in China and how that was driving the economy and how they couldn’t go on forever increasing loans – and a lot of that is in the shadow banking system. Is that really reflected in official numbers of bank lending – that is, the growth of lending in the shadow banking system? Kyle Bass: Which is a number they do release. Howard: And that is the broadest category that they release. We don’t consider it 100 percent reliable, but is nonetheless helpful from a trend point of view. Bass: For the record, we don’t deem anything coming out of China to be reliable, as far as data is concerned. You can look at aggregated data. You can look at, like in this case, the [People’s Bank of China] has a depository survey which is based on the four largest banks in China. So, anyway there are data sources that are homogenous throughout time, but they definitely aren’t all inclusive or comprehensive. Q: It’s been four months since your wrote in your letter to investors that you talked about a likely recession next year in China. Do you still feel the same way about your outlook as you did then? Howard: I think that what we were trying to outline in that letter is that if you saw a significant drop in the expansion of credit then you would likely see a pretty aggressive drop in economic activity as well. We were questioning the utility of that credit expansion because the rate of economic growth had seemed to disconnect and detach itself from that increase in credit expansion. So, we were concerned that if you can’t even generate particularly strong economic activity with such high rates in credit growth, once the high rates of credit growth started to mitigate and to decrease, then you would likely see an even more aggressive downward impact on economic activity. Now, it’s become apparent at least from the data that is being released that there has been a pickup in [economic] activity over the course of the last couple of months since we made those comments. Q: There’s been more bank lending? Howard. Well, there’s been a little more bank lending but there’s also been a pickup in economic activity. As Kyle mentioned, we take all that data with a healthy sense of skepticism. It certainly conveniently fits within the policy path that’s been set forth by the new Chinese Administration. So, we are, as I say, somewhat skeptical. But at the same time, it’s clear that we are seeing a pickup in some level of activity across the rest of the non-Japan Asia region, which suggests that there is certainly some movement in China. Bass: And there’s another point that we were trying to make in that letter that is important. When you talk about the shadow financing system, that’s really a non-bank phenomenon. And when you look at prior credit booms busting it is when the banks stop lending to the nonbanks. And beginning in June, you saw that the nonbank lending was not jumping onto the banks’ balance sheets at the end of the quarter, like it always does. That’s really what led us to believe that you were starting to see the banks not trust the nonbanks and the nonperforming loans start to pick up a little bit. You have 250 to 300 percent of GDP in bank assets in China. To compare that to the United States, we have about 100 percent of GDP or a little less in our banks today in bank assets. So, can China put another turn of GDP with bank lending? Well, yeah, because they control the spigot. Basically they can make the problem infinitely worse by continuing to force the banks to lend. And I think that’s what we’ve seen happen in the last 30 or 40 days. The short answer is that you don’t know when the government finally stops, but when they do, nonperforming loans will spike to more than 20 percent and the loss revenues will be 100 percent on those loans. Howard: And also on top of that, as Kyle mentioned, part of the thrust of the letter was that we were trying to suggest that the marginal return for each additional unit of credit that was being extended was diminishing. And that means that if there is a natural limit to how much credit can be extended, then we got to approach the impact that it has on the growth of economic activity would be even faster [and sooner] than it would otherwise be. Q: Thus economic growth would likely slow even if they kept lending. Q: So what does this outlook in China mean in terms of Hayman Capital’s investment decisions? Bass: We don’t invest per se in China. But we do invest in the economies that are some of their biggest trading partners. We currently have an investment in New Zealand, in their government bonds and their interest rate market place. From time to time, we invest in the Australian sovereign market place. As you know, we have a significant focus on Japan. All the peripheral nations will feel significant repercussions if China slows down. So, we follow China as closely as we can, but we have a real problem investing there. Q: How confident are you that China will slip into recession next year? Bass: That’s like asking me if we know when [China’s President] Xi Jinping is going to cut off the spigot. The best we can do here is be a coincident indicator and say well, if the banks aren’t trusting the banks and the Chinese won’t lower the reserve requirement at the banks, well then lending is going to contract, nonperforming loans are going to show up and they are going to have a problem. If the government wants to go for broke and continue to expand the banks’ assets – the old adage we use here is that the rolling loans gathers no loss – [they can]. And I think that’s what they are doing today. Clearly, when any of those loans go bad, they are going to lose 100 percent of their capital. So your question is how aggressive will the leadership of China get to try to starve off a significant recession and contraction. And the answer is pretty aggressive. So, we don’t know. Q: Since you don’t invest in China you really would not have an opinion on what this means for people who do invest in China I’m guessing. Bass: For people who invest in China I just don’t know how they believe the numbers are the numbers. Even in the Wikileaks you saw that our attaché to China said China keeps two sets of records. It’s clear you’re not seeing the real numbers. You’re seeing the numbers they want you to see. So, as a fiduciary, I don’t know how you invest in that environment. Bostanjiev says that due to the situation in the U.S., now is a good entry point for the "emerging markets investor" and says the Russian "story is still very constructive". In an wide-ranging exclusive interview, CNBC's Andrew Ross Sorkin talks with Lloyd Blankfein, Goldman Sachs chairman & CEO, about cuts in the Fed's bond-buying program; the move higher in interest rates; the trade in gold; the best candidate to head the Fed; joining the Dow, and how regulations are impacting the banking industry. Interview is from Chicago on CNBC's Squawk Box, September 18, 2013. Even after five years, there has been little acknowledgement of how the Lehman bankruptcy could have been avoided on September 15, 2008. A deal to spin off Lehman's bad assets to a Maiden Lane special purpose vehicle had been forged by Wall Street firms willing to lend the funds to make it possible. However, the sale of Lehman's good assets to Barclays Bank failed for lack of a temporary Fed guarantee of Lehman’s trading book. It may go done as the biggest mistake in the history of the Fed. The Federal Reserve could have prevented the bankruptcy of Lehman Brothers in September 2008 by briefly guaranteeing the trades on Lehman’s good assets. The Fed guarantee was needed for only about 30 to 60 days to allow time for a vote by Barclay’s board of directors on Barclay management’s decision to acquire Lehman’s good assets. By Saturday, September 13, a deal had been put together under direction of Treasury Secretary Hank Paulson and New York Fed President Timothy Geithner to break Lehman into a good bank and bad bank – and to sell the good assets to Barclays. The U.K. bank had agreed to buy Lehman’s good assets if Lehman disposed of what was then thought to be $40 billion to $50 billion in bad assets. Paulson had already been successful in bringing together major Wall Street firms to back a deal to dispose of Lehman’s bad assets, so the disposition of the good assets in a sale to Barclays was all that needed to be done to complete the rescue. The heads of the major Wall Street firms, meeting at the New York Fed Friday night, September 12, worked all night to hammer out an agreement to lend a newly-created special purpose vehicle $37 billion to buy the Lehman’s bad assets, hoping to eventually to recoup their loan principal when the troubled assets were later sold off. A who’s who of banking were present: Jamie Dimon from JPMorgan Chase, John Mack from Morgan Stanley, Lloyd Blankfein from Gold man Sachs, Vikram Pandit from Citigroup, John Thain from Merrill Lynch, Brady Dougan from Credit Suisse, and Robert Kelly from the Bank of New York Mellon. After the multi-bank rescue agreement was reached, however, a parallel effort underway among some of the bank chiefs to value the assets of Lehman reported that they thought the value of Lehman’s bad assets was only $27 billion. This meant the banks would be $10 billion short, assuming valuations never recovered. Yet, after some bickering amongst themselves and prodding by Treasury, the banks held firm in their willingness to do the deal. Barclays agreed to contribute some of its shares to the new entity to reduce the potential shortfall. On Sunday, September 14, at 8 am, Barclays chief executive officer John Varley and Diamond told Paulson, Geithner, and Securities and Exchange Commission Chairman Christopher Cox that the Financial Services Authority had declined to approve the deal. Geithner and FSA chairman Collum McCarthy, who said he had not rejected the deal outright but was wary of guaranteeing the trade during the time it would take for Barclays shareholders to vote on the deal. The FCIC reports that the New York Fed, meaning Geithner, had required that the Lehman’s obligations be guaranteed from the time of the sale until the transaction closed. [i] Geithner insisted that Barclays guarantee the trades, which had required of JPMorgan Chase during the time between its agreeing to purchase Bear Stearns and the closing of the transaction. Here is where things are muddy about why the Fed would not guarantee the trades. Paulson told the FCIC that a Fed guarantee was out of the question since the shareholders could reject the acquisition and the Fed would be in possession of an insolvent bank. [iii] Paulson was worried that a run on Lehman would continue during the time shareholders were voting, and the Fed would have to provide liquidity for Lehman, as repo lenders and other parties withdrew funds from the bank. Lehman’s general counsel Thomas Baxter told the FCIC that Barclays knew full well they would have to guarantee the trades because of the JPMorgan Chase/Bear Stearns precedent. Baxter said he believed that the U.K. regulators refused to go along with waiving the shareholder vote because the U.K. government was uncomfortable with the deal. Did anyone tell Barclays and the U.K. regulators that the Fed could not guarantee the trades? Was the option actually considered to make the deal possible? Without the Fed as a guarantor and with no other guarantor in sight, the deal to sell Lehman's good assets fell through and, with it, the agreement by the consortium of Wall Street banks to buy the bad assets. It would appear that the guarantee option was not palatable because Paulson and Bernanke were worried that it would not be sufficient to stop the ongoing run on Lehman Brothers, as nervous markets waited for a shareholder vote. If the U.K. authorities had decided to waive the shareholder vote, then there would have been no waiting period for financial markets. So, Baxter’s hunch seems persuasive. The U.K. government was too worried about contagion to waive the shareholder vote. Paulson appears to have been worried that if the liquidity squeeze continued at Lehman after the Fed guarantee its trades and the Fed ended up owning Lehman Brothers, it could have had serious market fallout for Washington’s ability to manage the financial crisis. It seems there was a bad case of jitters in both London and Washington. The jitters are more defensible on the part of the United Kingdom since the atmosphere of crisis had so far been contained to the United States. For U.S. authorities, however, the failure to act – to have the Fed guarantee Lehman’s trades in the good bank – revealed that the authorities had not come even close to understanding the fallout that would follow. Since it is difficult to know how an alternative history would play out, it’s hard to know with certainty whether both the U.K. and U.S. financial regulators by their inaction and inflexibility actually made the situation worse than it turned out to be. However, it’s also hard to imagine that if the Fed had guaranteed Lehman’s trades, and the U.K. authorities accelerated the shareholder voting process down to a week to 10 days, that it could have turned out worse than it did. Even if the Fed ended up owning Lehman, as Paulson feared, would it have been worse than what actually happened? When Lehman declared bankruptcy on September 15, 2008, it froze up financial markets around the globe and threatened to collapse global finance and plunge the world into a depression as regulators struggled to find ways to unfreeze the markets. Since September 2008, neither Paulson nor Bernanke have indicated whether or not they seriously vetted the idea having the Fed guarantee Lehman's trades and were prepared for the refusal of U.K. authorities to allow Barclays to guarantee the trades. Or, conversely, that they sufficiently considered the worst-case scenarios that would occur if Lehman failed. In fact, we know very little about the details of any of the options that were under consideration by Paulson and Bernanke in the waning days and hours of Lehman have surfaced. Paulson in his book, On The Brink, reported that he and Bernanke in daily one-on-one meetings at Treasury discussed possible options for rescuing Lehman. Paulson said the options were few but never identified any of them. Nor was any information on the options being considered by Paulson and Bernanke revealed in the work of the Financial Crisis Inquiry Commission, including its conclusions about what caused the crisis. If Bernanke and Paulson had already considered the potential use of the Fed guarantee option before the 11th hour and rejected it, we do not know. We do know that the Fed’s chief counsel Scott Alvarez had prepared a list of options for consideration by Bernanke and Paulson, but we do not know what they were. If the two had discussed and had already rejected a Fed guarantee on legal grounds before the Lehman crisis erupted into public view, it might explain why it was not seriously considered at the last minute, when it was so desperately needed. Curiously, in spite of the facts on the record, the perception emerged at the time of the crisis that the Lehman deal failed for the lack of a loan guarantee by the Fed to buy Lehman’s bad assets and not by the lack of a guarantee of Lehman’s trades to help facilitate Lehman’s good assets. This view that the failure of the Fed to guarantee a loan to buy the bad assets was based in part on statements made by Bernanke that the Fed could not make loans without sufficient collateral – this marking the difference between the Fed’s role in Bear Stearns, where it actually did lend money, and the Lehman case, where it was not necessary for the Fed to lend money to acquire the bad assets. Fed loans could have come into play if the run on Lehman had continued after a deal had been struck to sale the good bank to Barclays and have Wall Street firms lend money to buy the bad assets. The Financial Crisis Inquiry Commission in its conclusions found the regulators shouldered a good deal of blame for the crisis – but stopped short of pinpointing specific actions that were at fault. The irony is that after the devastating fallout from Lehman’s failure, the Fed did guarantee assets in a number of efforts to unfreeze the markets and prevent the failure of more large banks. In its biggest gambit, the Fed took part in an effort with Treasury and the FDIC to ring-fence or guarantee most of an enormous $306 billion Citigroup portfolio of troubled mortgage assets that threatened to bring down the bank. Under the agreement, Citigroup would take the first $29 billion in losses, while Treasury was on the hook for $5 billion from TARP funds and the FDIC for $10 billion. The Fed was on the hook as guarantor of last resort for the remaining $272 billion. Importantly, the value of those assets at the time of the guarantee were unlikely sufficient to cover the Fed’s exposure. [i] Financial Crisis Inquiry Report, Final Report of the National Commission on the Causes of the Financial and Economic Crisis in the United States, Official Government Edition, January 2011, p. 335. [ii] Financial Crisis Inquiry Report, p. 336. [iii] On the Brink, pp. 209-210. Sandy Will was guest host on Squawk Box on CNBC on September 10, 2013. David Faber of CNBC interviews Bruce Berkowitz of Fairholme Capital Capital Management on September 4, 2013. This week marks the 5-year anniversary of the U.S Government placing Fannie Mae and Freddie Mac into conservatorship. Bruce Berkowitz, Fairholme Capital Management, reveals why he believes the government should release Fannie Mae and Freddie Mac from conservatorship and restore the rights of junior preferred shareholders. San Francisco Fed President John Williams told CNBC the timing of the taper must depend on the economic data. He added that tapering should begin later this year, if the economy progresses. He refused to say when, but added: "Any tapering ... we do would be in gradual steps over time ... assuming our forecast comes true." SHANGHAI — Yan Meiyue, 90, said her 72-year-old daughter rarely visits. She doesn't even come home at the annual Spring Festival when families traditionally get together. Yan has been a widow since her husband died nearly 10 years ago. She now spends every weekday at a modest community center near her home. There she plays the Chinese board game mahjong and eats meals prepared by a volunteer staff. “The volunteers keep us company,” Yan said with a smile. She is one of a rapidly growing number of “orphan grandparents” who say they feel abandoned by their younger relatives, leaving them both lonely and struggling to make ends meet. 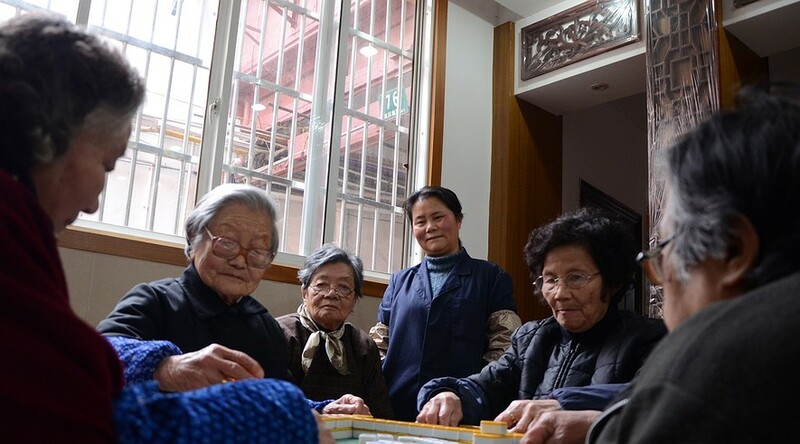 For centuries, elder citizens were traditionally treated with great respect in Chinese society. Younger relatives would usually look after their grandparents as they got older. Yet in the modern world, families are being split up by China's growing wealth. Children and grandchildren are now moving to distant cities or countries. And the elderly feel like they have been left behind. Note: Published in Los Angeles Times, Charleston Gazette, and elsewhere. Lakhsman Achuthan Tells Bloomberg TV "We Believe a [U.S.] Recession Began Last Year"
"Tyler Durden" at Zero Hedge reports how Achuthan challenges the conventional wisdom that the economy is doing well and how the anchors of the show, especially Tom Keene, defend their view. At 1:05, Achuthan stuns the Bloomberg anchors - "We believe that a recession began last year. Time will tell if that call is correct." "The jobs situation is great"
[LA] ...the job market is not doing well, all headlines aside. When you – I think the core thing here, and something that concerns us quite a bit, is the types of jobs that make money. So if you happen to be between the age of 35 and 54, since this so-called jobs recovery began three-and-a-half years ago, you’ve actually seen job losses, not gains, okay? Job losses for 35 to 54 year-olds approaching a million jobs lost. Now that happens to be, that 20-year span of your life, happens to be where you make the most money, and where you spend the most money. And so I think that is at the core of why, when you say, “Hey, jobs are great,” people say, “Eh, you know, it doesn't feel that way.” And they're right.